Stand out from the crowd even while standing still in the first-ever 2018 Toyota C-HR crossover. Thanks to unique styling with precision-cut lines, you'll leave a lasting impression everywhere you go in the C-HR. Once inside the spacious cabin, you'll find yourself surrounded by premium comforts, up-to-date technologies, as well as flexible passenger and cargo space that easily adjust to any adventure. You can also drive with peace of mind courtesy of the impressive array of safety technologies like the Toyota Safety Sense™ P (TSS-P), featuring a Pre-Collision System with Pedestrian Detection (PCS w/PD) and Lane Departure Alert with Steering Assist (LDA w/SA) keeping you safe and in control on the go. Come experience more for yourself when you test-drive a 2018 Toyota C-HR in Johnson City, TN, at Johnson City Toyota, also serving customers from Bristol and Kingsport, TN. When your 2018 Toyota C-HR needs maintenance or repairs, look no further than our service department where our professionally-trained technicians are equipped to handle all your service needs. Whether you need a simple oil change or major repairs, you can trust the quality service you'll receive here at our dealership. 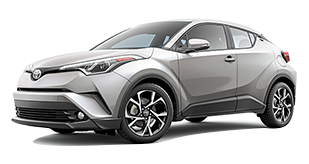 If you'd like to purchase or lease the 2018 Toyota C-HR in Johnson City, TN, stop by Johnson City Toyota at 3124 Bristol Highway, Johnson City, TN 37601 for a test-drive today. We look forward to serving our customers from Johnson City, TN, and throughout Bristol and Kingsport, TN.